The New European Ensemble was founded in 2009 in the Netherlands by dedicated and passionate musicians from across Europe. The ensemble has built a reputation for imaginative programming as well as ‘fantastic’ (NRC) and ‘excellent performances’ (de Volkskrant). Some of today’s leading composers like Kaija Saariaho, Magnus Lindberg, Mark Anthony Turnage and Sofia Gubaidulina enjoy working with the group. The ensemble’s goal is to present new music and 20th century classics in exciting ways, often by combining music with other art forms like film, literature, theatre, dance and visual art. The musicians strive to share new music with a broad audience while challenging themselves artistically. Composers from the Netherlands and around the world write new work for the ensemble. Established composers like José María Sánchez-Verdú and Klas Torstensson as well as many younger composers. Justin Christensen, Đuro Živković and Benjamin Staern were awarded prestigious composition prizes for works written for the ensemble. Future premieres will include works by Gabriel Prokofiev, Anna Thorvaldsdóttir, Carlo Boccadoro and Martijn Padding. The ensemble has profiled itself with critically acclaimed music theatre productions. In 2014 the musicians created BARE with choregrapher Kenzo Kusuda. The group co-produced the operas Dr. Miracle’s Last Illusion and Hamlet with OPERA2DAY in 2016 and 2018. In 2017 the ensemble toured the Javanese L’Histoire du Soldat, in which Stravinsky’s masterpiece is combined with traditional Indonesian dance. The New European Ensemble performed in nearly all of The Netherlands’ major concert halls and theaters among them the Concertgebouw, Carré Theater and Muziekgebouw aan ’t IJ in Amsterdam, De Doelen in Rotterdam, Tivoli Vredenburg and The Royal Theatre in The Hague. The ensemble performs regularly at festivals such as Gaudeamus Muziekweek, Grachtenfestival, Festival Vlaanderen, Oriental Landscapes and Dag in de Branding. International tours brought the group to the UK, Germany, Belgium, Sweden and China. 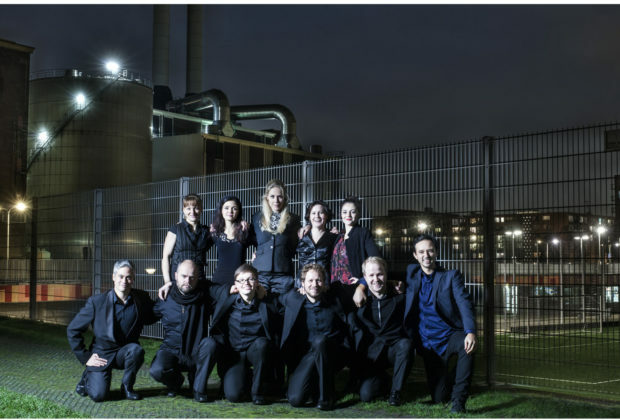 In 2012 the group was ensemble- in-residence at the Sounds of Stockholm Festival and in 2014 the ensemble presented multiple programs at the Made Festival in Umeå for the 2014 European Capital of Culture. The ensemble’s musicians regularly work with young composers and performers at the conservatory level including at the Ensemble Academy, a partnership project at The Hague’s Royal Conservatoire.